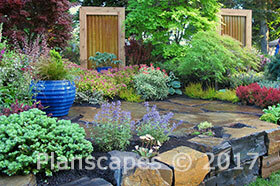 Flagstone pavers, planting and privacy screens create an inviting outdoor room. 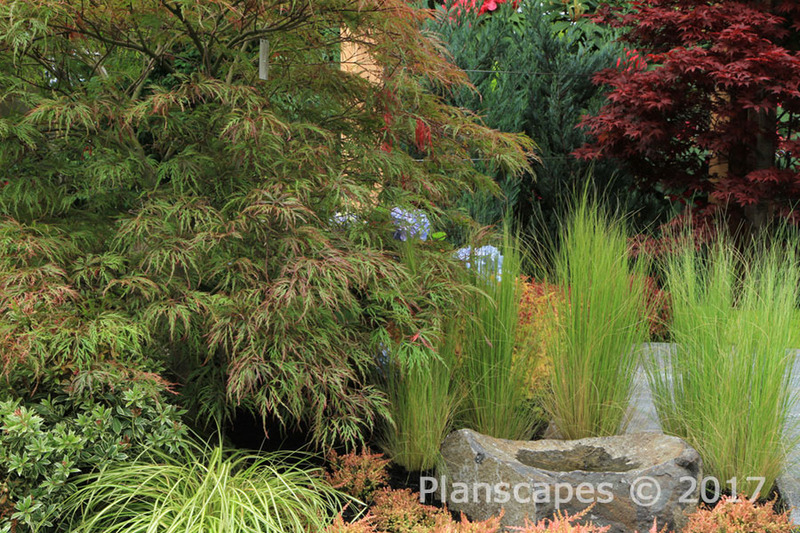 Japanese maples, shrubs and ornamental grasses add color and textural interest. Pam’s great joy is creating gardens that bring beauty, harmony, peace, and a place for her clients to connect with nature, offering a sense of retreat. 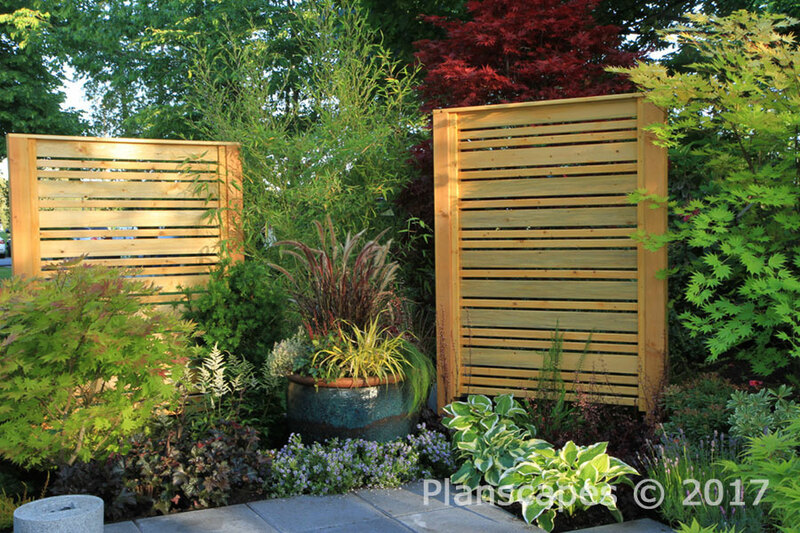 Pam is passionate about educating clients to incorporate sustainable practices into their landscapes. In her business, Planscapes, Pam works closely with clients, developing positive relationships that encourage collaboration, creativity, and satisfying results. 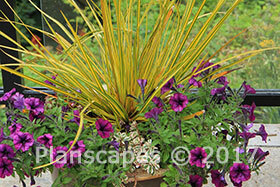 Planscapes designs encourage wildlife friendly gardens, edibles and year round color and outdoor living. 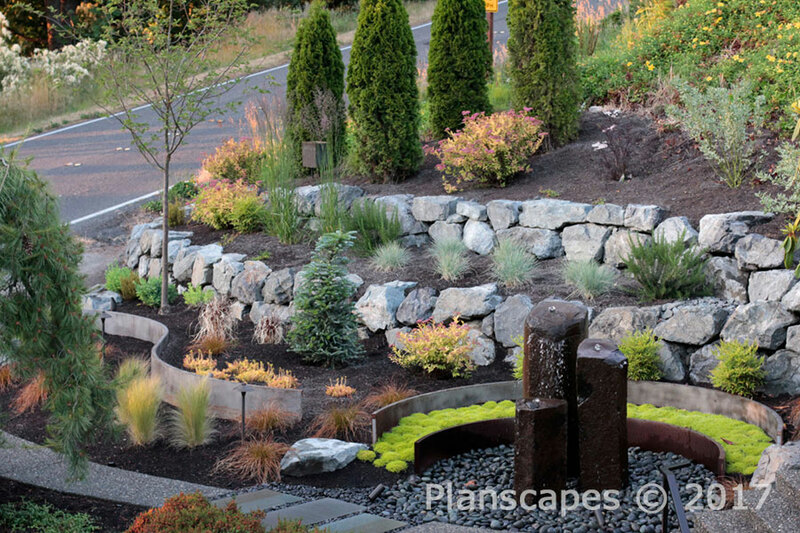 With over 35 years experience as an award-winning landscape designer, Pam has designed residential and commercial projects in the Pacific Northwest and Arizona. 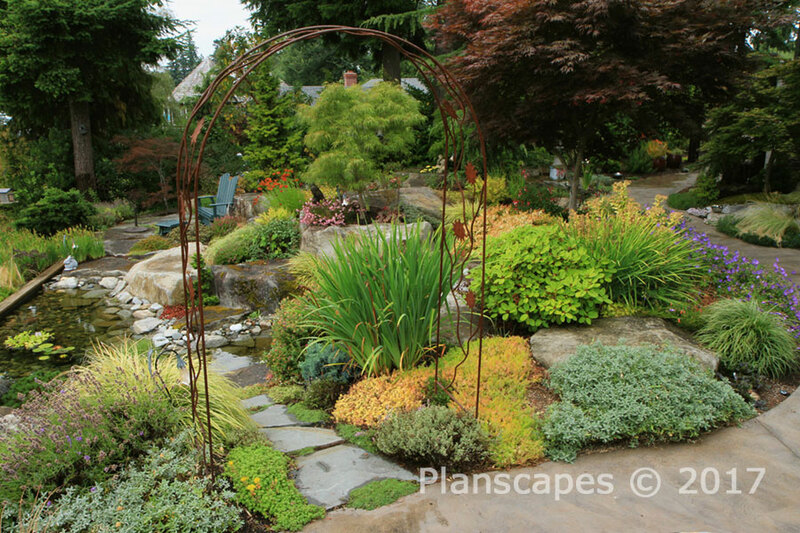 She’s designed award winning display gardens for the Northwest Flower and Garden Show and several other local garden festivals. 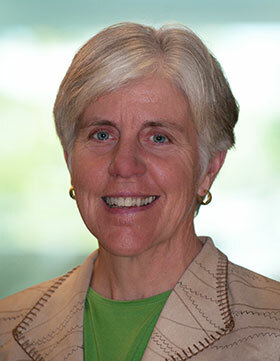 Pam has extensive experience designing native plant restoration areas in public parks, and demonstration gardens. Her gardens have been featured in several publications including Sunset Magazine. 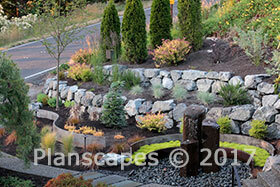 Planscapes focuses on design, consultation and client advocacy during installation. Pam has developed good working relationships with many skilled installers to implement designs. Planscapes also installs containers and edible gardens. As a Pacific Northwest native, Pam connected with nature at an early age, spending most of her time outside, building trails, camps and mini retreats in the woods behind the family home. Growing up with three generations of avid gardeners, she developed a love and appreciation for gardens. Pam started out in the landscape industry hands on, operating a wheelbarrow and shovel while studying design, progressing to equipment operator, project manager, and designer. Time spent in installation, design, and maintenance gives Pam a depth of experience and a well-rounded approach to her design projects. Formal education in design and horticulture complements this field experience. 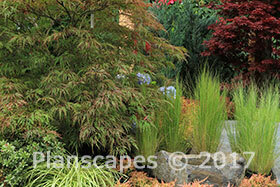 The mix of trees, shrubs, perennials and grasses enhances the hillside setting. 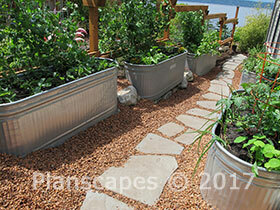 Plantings accentuate the flowing pathways. Flagstone path and arbor invite exploration. 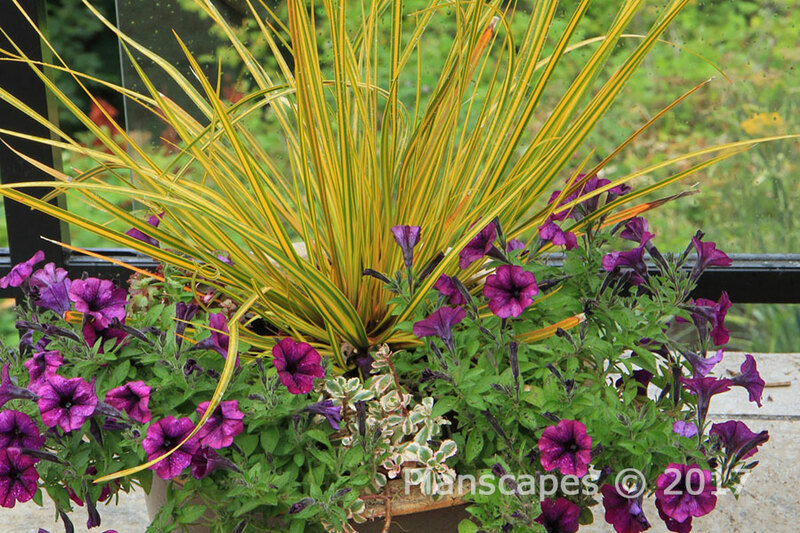 Seasonal planted containers add color accent. Containers take advantage of narrow space offering a bounty of edibles. This colorful garden is located on a bluff overlooking Puget Sound. 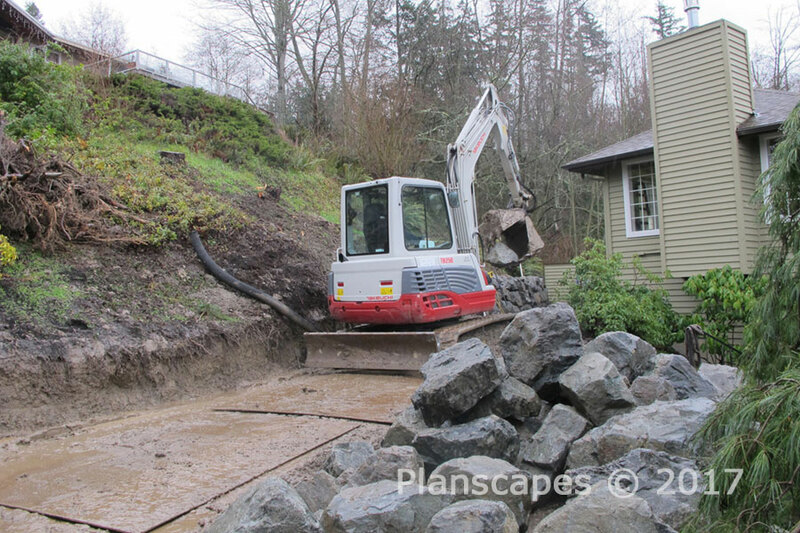 The clients had installed the extensive waterfalls and large boulders prior to my involvement in the project. 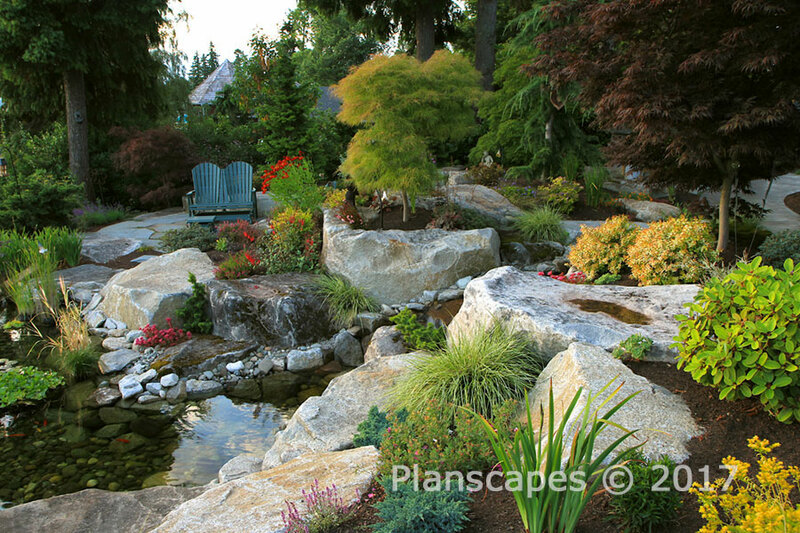 Planscapes was presented with a fun opportunity to bring color and life to an already amazing setting that was in need of just the right plants to complement the water feature and paths. An overall intent was to provide a peaceful, calm and beautiful setting for the clients who are both business owners with full schedules. The clients asked for year round color and interest and wanted to invite in hummingbirds and butterflies with appropriate plant material. They wanted to include elements that would allow the garden to become a certified Wildlife Habitat Garden. The west facing property had some harsh site conditions to consider in selection of plant material. The clay soil in existence also presented some challenges to consider in plants selection. Plants offering color and interest throughout all four seasons were planned into the design. The clients entertain frequently during the summer months and host fundraising events, so it was important to plan optimal color during this time of the year. Bright colors were incorporated as a cheerful element. Containers were added in key locations for summer and fall seasonal color pops. Drip irrigation was added to these containers for ease of maintenance. The design considered both the ground level use and appearance of the gardens as well as the view looking down from the deck and upper story windows. A flagstone path was added, leading to a flagstone sitting area offering a quiet, peaceful sitting area to enjoy evening sunsets and to give the band a place to set up during entertainment events. The clients enjoy featuring local artists and areas to incorporate art were designed into the layout of plants and other key elements of the garden. 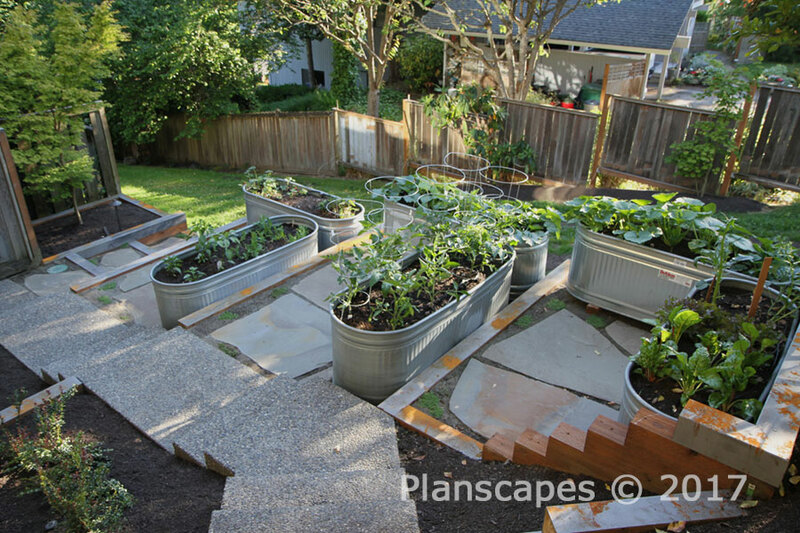 The south side yard was very narrow, but offered optimal conditions for growing edibles. The use of terraced stock tanks turned this area into a bountiful garden, producing crops of delicious vegetables, herbs and berries. Pam has continued to be involved with this project over several years, planting seasonal color in the containers, providing fine pruning and designing new additions to the landscape. 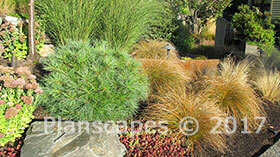 Ornamental grass, sedums and dwarf pine provide year-round textural interest. 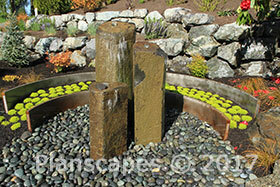 Basalt column water feature encircled by Corten steel walls inter-planted with moss. 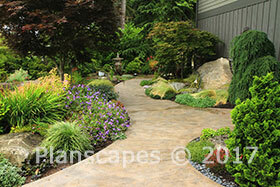 This client was referred to me by a local landscape contractor that I often collaborate with. The home was located in south Snohomish county. The owner had a fast paced demanding job that required quite a bit of travel. The interior of the home was undergoing extensive remodeling to create a calming retreat using colors and bold architectural elements that were reminiscent of the clients family cabin in the lakes region of the midwest. Planscapes was asked to design the project to create a feeling of peaceful retreat to balance the stressful work life of the client. Heeding the clients wished to connect the interior with the exterior, key focal elements were located in areas that could be viewed from the in home office and the living room. 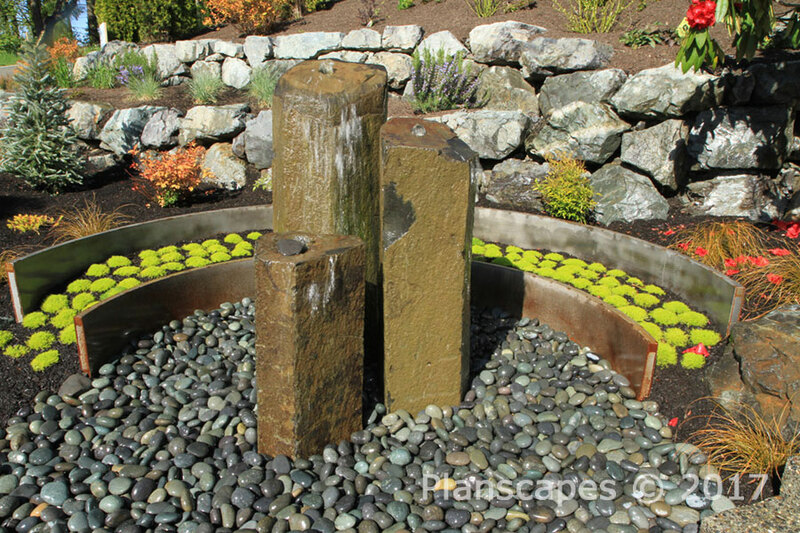 A basalt column water feature became the focal point along the path to the home entry. The soothing sound of water offered the client an opportunity to transition to a calmer, relaxed state when returning home. The columns were situated so they could also be viewed from the clients desk. The site had some topographical challenges with a steep slope on both the east and west sides, and an old crumbling rock wall that did not offer much useable space along the front entry path. A redesign of the east yard with a new rock wall allowed for more useable area with terraced plantings and a curved corten steel wall to create a sense of flow along a new entry path. The golden green color of the scotch moss contrasted nicely with the curved corten steel walls. The moss still looks good 5 years out. 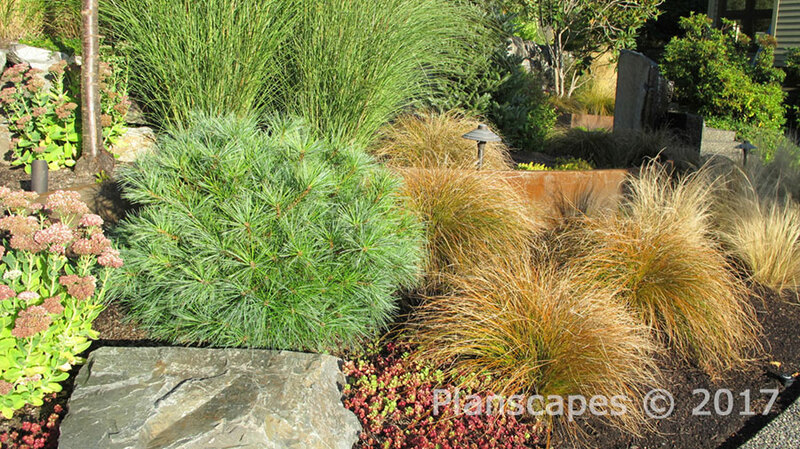 The plant palette used a variety of color and texture while concentrating on low maintenance and primarily drought tolerant plants. The client loved grasses, so drifts of grasses were incorporated in the front yard. In the previously unusable sloped west side yard, Planscapes planned terracing using cedar 6x6’s capped in corten steel to create flat areas. The client wanted an area for edibles. Raised stock tank planters allowed for easy access to beds for edibles. This area produces a bountiful harvest every year. Planscapes was closely involved in the installation, to ensure adherence to the design and recommend any on site revisions. Colorful retreat with strategic privacy screens. Looking for the right landscape designer for your project? Our directory lists our trained and highly qualified members. Click here to find the perfect landscape designer for your needs. 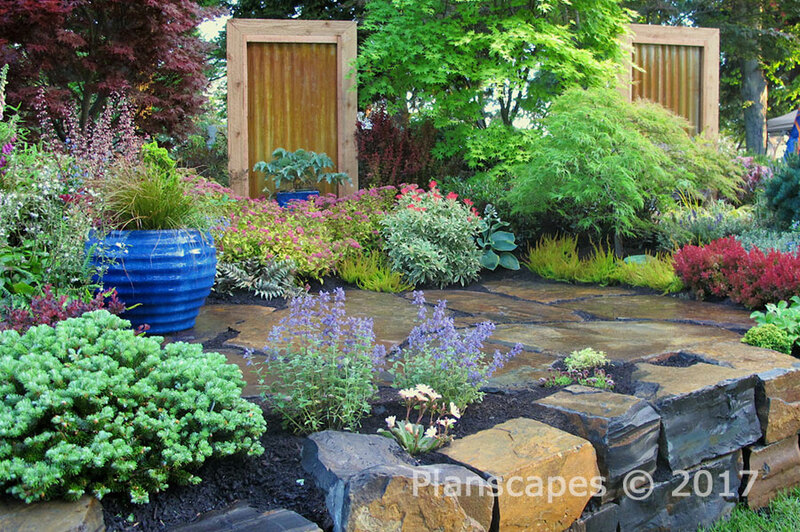 Are You a Landscape Designer? Contact APLD at contactus@apldwa.org, to discuss how you can become APLD certified. of Private Gardens Design, Inc.